I had been searching for the solution to a single-serve coffee machine–because I live alone–that would deliver a really spectacular cup of coffee. I’ve found my answer with the TRU digital single serve coffee maker, and its two hundred fifty different choices of gourmet Pods from which to brew, I’ll be trying new flavors for a long time! I enjoy the convenience of brewing from a pod with the TRU digital single serve coffee maker because it’s quick and easy, with no clean-up. I always ended up with a dusting of coffee grounds on the counter, no matter how careful I tried to be when I was brewing with standards ground coffees, but the pod brewing leaves no mess at all. The pump action on the TRU digital single serve coffee maker extracts all the liquid from the pod, which seems to work more efficiently than the models I’ve tried which drip the boiling water through the pod itself. The pod chamber slides out easily, I pop in my pod of choice, fill the reservoir (which lifts out of the machine to put right under the sink–another easy-to-use feature I applaud), and the TRU digital single serve coffee maker is off and running! The control panel is easy to figure out and easy to read and not too complicated since the “customization” of any cup is in the choice of the pod I use. I should note that the TRU digital single serve coffee maker is pretty tall; it doesn’t fit under my kitchen cabinets, so I had to clear a spot for it on a stretch of open counter without overhanging cupboards. It looks pretty classy there, if I do say so, and the multi pod holder makes it easy for me to make a flavor choice from my wide selection every morning. I enjoy matching my coffee to my mood, and with the single-serve brewing, I can enjoy a different flavor with my second cup. My single serve machine brews a pretty quick cup, too–less than a minute to make a fresh cup, even including the time seconds to pop in the new pod. When I first bought the TRU digital single serve coffee maker, I was pretty sure I’d also have to buy a regular coffee pot for when family visits from out of town, or when I’m hosting my book club. I just figured there would be times when I’d need an actual coffee pot. 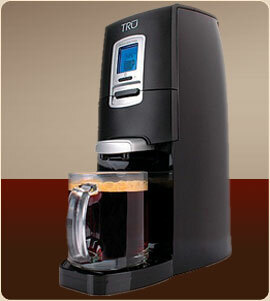 As it turns out, though, the TRU digital single serve coffee maker has been great even with groups. Each cup brews quickly enough that I don’t end up with people waiting around for their own coffee, and guests enjoy getting to choose their own individual flavors from the selection I keep in the pod holder. My sister asked me once if it weren’t an inefficient method to have to keep buying the pods to use my machine. From my perspective, though, this is cost-effective compared to the coffee shop expenses I ran up before I bought the TRU digital single serve. Sure, it’s more expensive than buying generic ground coffee, but it fits my budget, it saves money compared to my coffee-shop habit, and the enjoyment I get out of it (not to mention how super-easy it is to brew a cup of coffee) makes it absolutely worth it for me.